Hello, sorry for the bump. I wonder if these are cameos from Nisio Isin's latest light novel Okitegami Kyoko no Bobiroku. Anyone else know or think they know who they are? 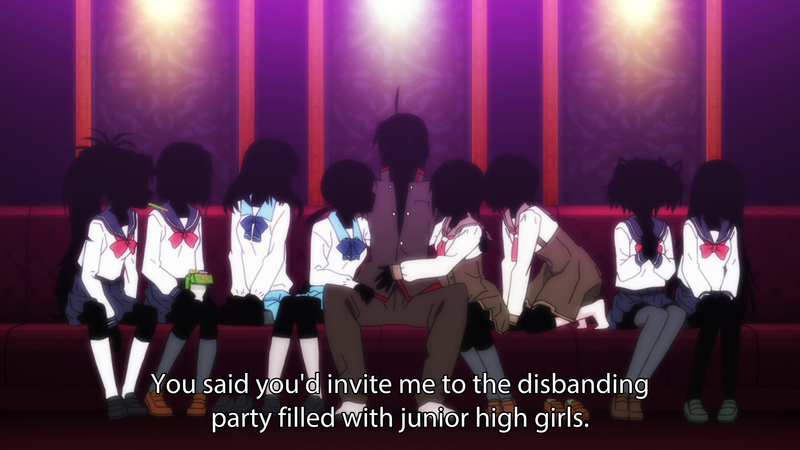 If I'm not mistaken - these are Hanekawa Tsubasa and Kanbaru Suruga. No cameos from his other novels here. As far as I know - there are some references to Zaregoto in his novels, but not in the anime (even if there are - they are just not so obvious). Last edited by stray; 2015-09-24 at 22:18. Is there a timeline chart or something somewhere for anime viewer only? Thanks. dynamic content not loaded. Reload? I put together one recently, and I was thinking about asking to make a thread for it. I just need to double check the data and also try to figure out a way to clean the table up to make it more presentable. There is also the concern with how to put a table in forums, but I pretty much figured out what I want to do with that. Probably an updated version of this around. How would one even begin to mentally prepare themselves to tackle this series? And here I thought steins;gate was a headache. Just watch it in airing order. Everything makes sense once it gets connected. To be honest the series kind of intimidates me especially when you consider the dialogue, how should deal with Monogatari's dialogue? The dialogue seems to into self indulgent territory. I guess you are right? Wouldn't know. I haven't worked up the courage to move to episode 2 of Bake. All times are GMT -5. The time now is 01:46.